liberal - Favoring proposals for reform, open to new ideas for progress, and tolerant of the ideas and behavior of others; broad-minded; favorable to progress or reform, as in political or religious affairs. partisan (adj) - Devoted to or biased in support of a party, group, or cause: partisan politics. These two words are neither synonyms nor related. One may be liberal but not particularly partisan (Bill Moyers), partisan but conservative (Harry Reid), or liberal and partisan (Ted Kennedy). The current GOP is principally partisan, not ideologically coherent. George Bush is hated by liberals not because he is conservative (like Ron Paul), but because he is viciously partisan in everything he does. Hillary Clinton is running as a partisan, but not particularly liberal Democrat, while Barack Obama runs as a liberal with less fidelity to the Democratic Party. The Baltimore Sun every year around this time publishes its review of winter beers. Results are, of course, skewed by availability; I believe, also, that draft-only offerings from brewpubs don't make it to the panel. The article lists suggested retail prices, and, in case you can't find the beer at your local store, it mentions the wholesaler who distributes the beer, and its phone number. Well done! This year, the surprise was that three of our top six domestic beers were from Maryland. 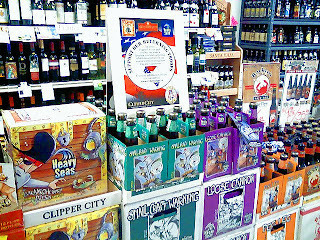 The Snow Goose Winter Ale, Clay Pipe's Pursuit of Happiness Winter Warmer Ale and Clipper City's Winter Storm were brewed locally. Our panel members could be accused of being "homers," but we didn't know what we tasted. The bottles we sampled were cloaked in brown bags. We also liked three out-of-towners: Allagash Grand Cru from Portland, Maine; Brooklyn (N.Y.) Black Chocolate Stout, and Sierra Nevada Celebration Ale from Chico, Calif. On the international front, we picked three balanced English ales (St. Peter's Winter Ale, Ridgeway Lump of Coal and Samuel Smith Winter Welcome) and three very strong Belgian brews (St. Bernardus Christmas Ale, Kerstmutske Christmas Nightcap and Equinox Dark Winter) as the beers we would like as companions on a winter's evening. It's interesting to compare Kasper's picks this year to those last year. For beer drinkers, this is going to be an espresso Christmas. Many of the best-tasting brews I sampled in the crop of 2006 winter beers had distinct coffee and chocolate notes. Yet they still tasted like beer. A post today on the Yahoo Groups Cask-USA (another project of Mr. Alex Hall!) deals nicely with what is cask ale, what isn't, and what is hand-pumped cask ale and what isn't. I was given permission by the author, Dave Brown, to repost. I love cask ale. But I have found that not all 'hand pumps' serve real ale in the proper sense. They are one of the following. Casked ale under goes secondary fermentation in the cask, providing all carbonation. Cask would be vented and open to air, ideally served cool. The flavour would change/develop over a few days, before going 'off' from contact with air. Appears common with imports again. This is a standard KEG beer, which is served with a real hand pump at low carbonation. Not real ale. I have one, its cool. But its fake and deceiving You use it like a hand-pump, but it just dispenses LOW-pressure / lower carbonated (or full pressure, take your choice) kegged ale/lager. Be sure to read beer blogger's Stonch's comment below. Just as the presence of a hand pump does not equate to the beer being "real" cask ale, the converse is also true. 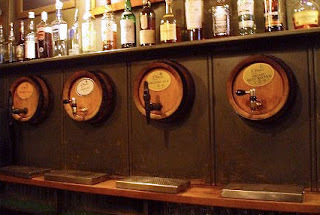 You can have "real" cask ale that is dispensed by other methods: the most obvious being gravity (tapped straight from the barrel) or via an electric or air pressure pump. 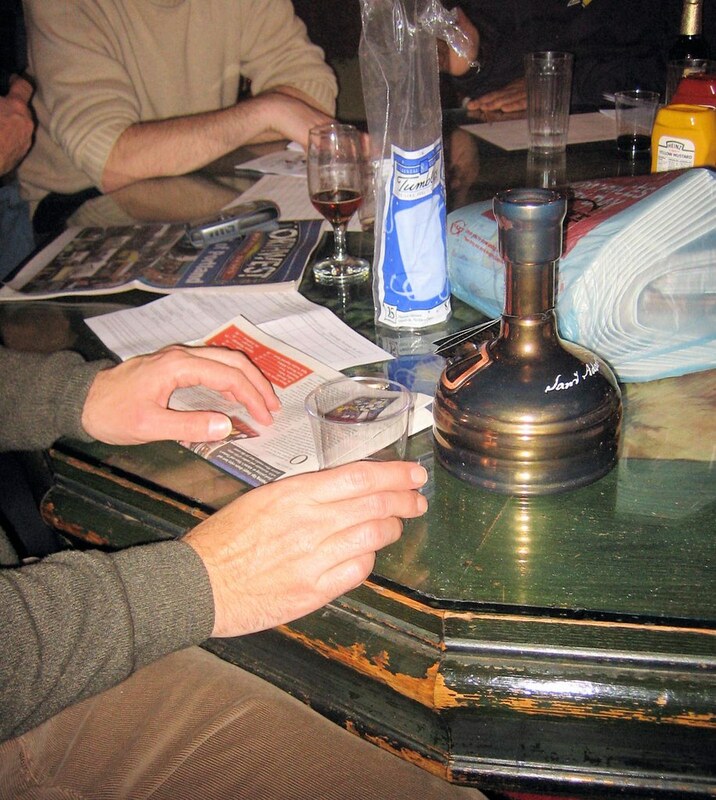 None are common in pubs in England, although the air pressure pumps can be seen in lots of traditional Scottish pubs. I'm not sure the electronic pumps survive anywhere, although they used to be quite common in more northerly parts of the UK. I’m getting a lot of email asking if you can join if you’re not vegan/joining late/not usually writing about food. The answer is yes! If you’re writing about vegan food or taking photos of vegan food or whatever you are doing, you can join. Especially the people who aren’t vegan but intend to try it out this month. I participated when I posted my Thanksgiving veggie menu. To be precise, the Kugelis I served contained eggs, and thus wasn't vegan. The other dishes were. The United States now has 500 bars and restaurants serving real ale on a regular basis. That's according to the American Cask Ale Database maintained by cask ale entrepreneur Alex Hall. "Roll on 1000 I say...", as Alex says. More on cask ale here. I became a Redskin football fan upon hearing my first game in 1966. Back then on Sunday autumn afternoons, my father and I would rent a rowboat at a local park. Out on the lake, we'd tune into Redskins' games on a small transistor radio. The team wasn't very successful then, but that didn't matter. It's been reported this morning that Redskin player Sean Taylor has died of gunshot wounds suffered during a home invasion. Twenty-four years old, Taylor was the team's safety, playing the position in an athletically dramatic and ferocious manner, and playing his best yet this year. One is reminded of the fragility - and preciousness - of life when anyone dies, and again, when it is a young person, not yet in his prime, who dies. His family and the Redskin team and fans mourn. Sean Taylor is survived by his 18 month old daughter. That young girl will never have the time with her father that I had with mine. Michael Jackson's newest (and final) book is appropriately entitled Beer. It is published by Dorling Kindersley, as part of its Eyewitness Companions series. I purchased a copy a few weeks ago, but have only given it a time-constrained cursory look. The clerk at the bookstore expressed intrigued surprise that the Eyewitness series now included a book on beer. Considering Beer's author and editor, I should, and will, read it enthusiastically - as should you. 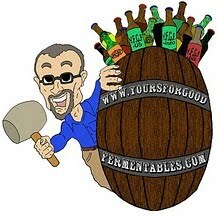 Stan Hieronymous, a beer author himself, took the time to do so, and reminds us why. Geeky observation: On the cover above, the two specific beers appear to be, I believe, Charles Wells and someone's old ale. On the the cover of the edition I purchased, they are, instead, Sierra Nevada Celebration Ale and a handpump of Fullers ESB. "I think of beer as food," says Lucy Saunders, author of the new Best of American Beer & Food. In the opening of Aaron Copeland’s “Appalachian Spring,” there’s a wonderful set of “call and response” chords that progress in intensity and are so refreshing, repeated in variations throughout the suite. The music was a score for a ballet by Martha Graham and I think of pairing beer and food as live performance, subtly influenced by mood and environment. The right music will lift my mood and make me enjoy my environment - even when I’m stuck behind the desk. I listen to jazz and classical music when I write, and rock and roll when I cook. My bakeware is stored in the basement to make room for stereo speakers in the kitchen. Something about the clatter of pans and smoke from searing meats matches best with the English Beat or the Decemberists. But when I’m thinking about pairings, I think about flavor progressions that build in tonal intensity, the “call and response” of malt to caramel, of citrus to hops, of apple or banana yeast esters to warming spices such as cinnamon and nutmeg. Beer, food, music, life: it's all about context. Would a good beer be as good if sampled in solitude? Lucy Saunders was in the DC area a few weeks back. I met up with her - and Greg Kitsock of Mid-Atlantic Brewing News - at Rustico Restaurant in Alexandria, Virginia. We sat at the chef's table. Chef Frank Morales was just back from creating a Sam Adams Utopias beer dinner for a select audience, including Jim Koch, at Walt Disney World. Still feeling the Muse, he created an amazing small portions menu for us. Beer manager Greg Engert paired the plates with beers. Can I remember the items? Unfortunately, no. Other than writing down about the use of wood (beginning that night) in the 700°F Italian pizza oven, I didn't take notes. But you can see photos of the dinner, here on Flickr. Great pizza being a combination between the sauce and the dough, look at that perfect crust! A (little) bit of food humor. The customer is served his pizza. "Would you like that cut into four slices or six?" he's asked. "Only four," he replies, "I'm not that hungry." There's nothing about pizza here, but there is a lot about (a lot of) food. It's the menu for my veggie Thanksgiving. ---> First, the beverage: a bottle of The Brewer's Art Green Peppercorn Tripel. This wasn't the beer served during the meal, but it was the one drunk during the cooking. What beverage WAS served at dinner? It wasn't a Riesling or Beaujolais. But it was a beer. Read on. ---> Every Thanksgiving meal needs a gravy. Mine was modified from a mushroom sauce in Isa Chandra Moskowitz's book Vegan With a Vengeance. As she suggested, I thickened it, but with 1/4 cup potato starch. And where she called for 1/2 cup white wine, I substituted with Clipper City Brewing's Peg Leg Imperial Stout. ---> When cooking Brussels sprouts, I normally steam them until just tender. For this meal, I roasted them instead, quartered, for 15 minutes at 425 °F. The sprouts develop a caramelized sweetness prepared this way, but be careful not to overcook them. I finished them with a warm vinaigrette of lemon juice, lemon zest, fresh thyme, mustard, horseradish, and diced shallots. ---> The Mrs. Dash website has a recipe for what it calls Cauliflower Popcorn. Break up the head into popcorn-size florets. Toss with olive oil and 2 TBSP Mrs. Dash (or use whatever spice, s/p combo you might prefer). Roast for 60 minutes at 450 °F, tossing several times. I saved the stalk for later, cut into coins, and braised in veggie stock. 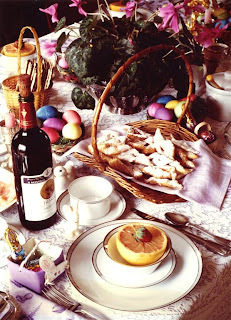 ---> I eat eggs - that I know of - three times a year: Christmas, Easter, and Thanksgiving. Here's my version of my mother's Lithuanian Potato Kugelis. It's hearty Lithuanian fare, so it contains eggs. I borrowed a tip from beer blogger Bob Skilnik: adding 4 crushed Vitamin C tablets to the water prevents the potatoes from discoloring. Kugel preventing the common cold ... who knew? ---> Alice Brock - of Arlo Guthrie's Alice's Restaurant fame - has a recipe for Cream of Salt and Pepper Soup. It's sort of making it up as you go along, similar to the genesis for my recipe for Nut Loaf. It changes each time I bake it. On this occasion, I used walnuts, peanuts, and chestnuts. The loaf was good, especially with the gravy, but I wasn't completely satisfied with the result. I'll post the recipe when I am. 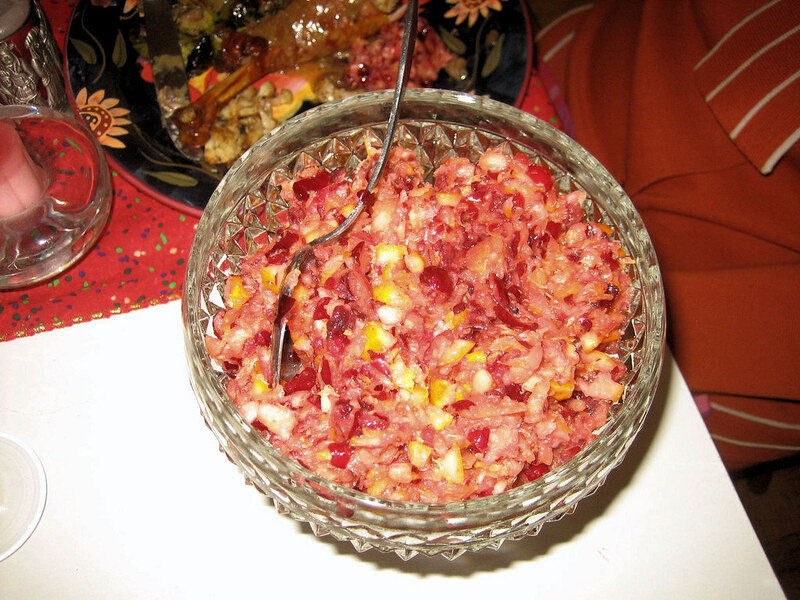 ---> My brother prepared the family recipe for Cranberry Relish: cranberries, oranges, orange zest, and apples - grated through an old-fashioned hand-cranked grater - and (his touch here!) sweetened with Splenda. ---> Now, it's time for dessert. My brother's girlfriend baked a delectable lime pie. I made, what I called, The Pumpkinator, a tofu pumpkin pie. It's the Washington Post's Kim O'Donnel's recipe from her What's Cooking blog. Tofu haters: this was delicious. Kim calls it a doppleganger recipe: that is, until you're told, you wouldn't know it was tofu. Use silken tofu for the proper texture. I 'cheated', using a pre-made Graham cookie crust and canned pureed pumpkin. For how to bake pumpkin itself, go here. Hope you enjoyed. Find more photos of our dinner here. The Brewer's Art is a brewpub in the 'art' district of Baltimore, a long walk up Charles Street to mid-town from the touristy Inner Harbor. The food is bistro-inspired, the house-brews, Belgian-styled. It's certainly worth the trek. Since The Brewer's Art opened in 1997, its beers have been draught-only. But, now, if only for one of its beers, you may not have to trek! The Green Peppercorn Tripel, a seasonal at the pub, has been released in limited quantities of 750-ml champagne-corked bottles for distribution in Maryland and D.C.
Be careful when you pour it: the white head is spumous and BIG! The appearance is gold/light orange in color, and hazy - more so upon chilling. There's a restrained estery aroma: maybe roses and melons. And it might have been the power of suggestion, but I thought I did catch a whiff of green peppercorns. The flavor proffers biscuity sweetness, subtle notes of sweet cooking spices, and some more of that melon fruitiness. But all of that is balanced by the snap of the high carbonation level and by a mildly spicy heat that sneaks in at the finish. The green peppercorns' spiciness substitutes - in subtle fashion - for some of the hops' bitterness. It's not overdone; in fact, it's very well done. The evening before Thanksgiving is one of the busier bar nights of the year. The folks who are leaving town have left. The folks who have stayed, tired of cooking, go out to play. The night found me at the Majestic Lounge of the Evening Star Cafe in the Del Ray neighborhood of Alexandria. 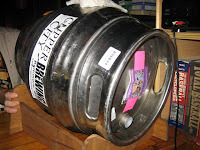 I was there to tap a firkin of Clipper City's Loose Cannon Hop3 Ale. To my left and right were military men about to return to the Iraq theater. One was a fan of Clipper City's seasonal spring beer Red Sky at Night Saison. He told me that before he knew I was from the brewery. The other was astonished by the character of freshness from the Loose Cannon cask. He had never experienced that before. They were thanking me, when it was they who were soon to return to a war zone. Sometimes it's the non-beer-geeky moments that can make a beer guy's day. I did a bit of early Christmas shopping late this afternoon at a mall ... three days before the post-Thanksgiving madness. Afterwards, I stopped at the Rock Bottom brewpub in the mall for a quick pick-me-up. Had a cask-conditioned porter: quite tasty. A young lady sat down next to me, and asked for a Miller Lite. "Sorry, we serve only the beers we make here", replied the bartender, standing directly in front of the fermentation tanks. "You make your own beer? ", she asked, bemused at first by the visual and spoken evidence. She thought for few moments. The bartender fidgeted. And then she asked for the lightest they made. Ah ... so much good beer proselytizing yet remains undone. "Do you have any New Orleans beer," I heard a shopper ask at a beer store over the weekend. "Well, we have Abita - it's close. But Dixie? No, it's underwater." they plan to begin rebuilding the building. "We want to put in a smaller, state-of-the-art brewery in the building," Joe Bruno said. They also plan to add an "Old World Bier Garten," on the rooftop and specialty shops. There were other points in the article also worth looking at. Micro breweries are now major factors in markets, [Steve] Hindy [of Brooklyn Brewing] said. "They are the fastest growing product these days," Hindy said. "They are growing faster than wine or liquor." That is, of course, a good thing. But now the chance to fail is greater, and the loss from failure, greater. the major brewers are aggressively getting into the craft beer category as well. The mainstream beer corporations no longer see craft beer as a niche. Craft beer can longer hide behind its quirkiness and smallness as protection. "Distributors will take your beer, the hard part is at retail," [Hindy] said. "There is limited shelf space and it's hard to get." Tom, the beer business is a real-estate business: it's about the acquisition of real space on the shop shelves, the acquisition of real placements behind the beer bars. Once the most popular of the 13 beers brewed in New Orleans, demand fell in 1975 when fumes from a chemical being used to clean the floors tainted the beer's flavor. That was the first step on its steep slide. That's a parable whose lesson all breweries large and small need to take to heart. Be proactive with quality control, with quality assurance. But when your brewery does develop a problem (and that's when, not if: read here), take aggressive, appropriate, and immediate steps. Meant sincerely: good luck to Kendra and Joe Bruno, and good wishes for the return of Dixie. Here's more from my friends who recently traveled to London in search of good mild. I'm a vegetarian, but I will NOT be having faux turkey meat for Thanksgiving. Blech! Ever heard of side dishes? You know sweet potatoes, other root vegetables, etc? Beer, of course, is a wonderful vegetarian foodstuff; no wine needed! Speaking of meat subsitutes, the creator of Tofurky hails from the D.C. area, even though Seth Tibbot moved long ago to the left coast. Here're the minutes of a recent on-line discussion at washingtonpost.com of recipes for a non-meat Thanksgiving. And click here for "what's a vegan, anyway": an interview with Post-Punk Kitchen's Isa Moskowitz. 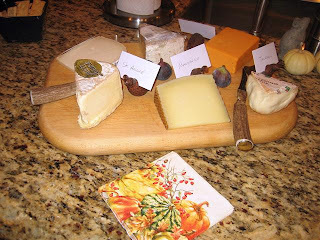 That's the cheese plate for a beer and cheese tasting I tutored at a private residence last evening. I walked 20 participants through the tastier points of flavors and pairing. The evening was a silent auction award from the Brewers Ball against Cystic Fibrosis. Wine is a movie; beer is a Broadway show. Beer is a more a complex beverage than wine. With beer and cheese pairing, there are no rules, only enthusiastic suggestions. No need for a cracker; beer is the cracker. Taste the beer; taste the cheese; finally, taste the beer and cheese together. There are no bad beer and cheese pairings; some are better than others. Strong stout and Stilton tasted together make for a flavor dance. I would have preferred the nutty/butterscotch sweetness of an aged cow's Gouda, but this cheese was a crowd pleaser. Slightly tangy, mildly goaty. Grassy character of this sheep's milk is complemented by the grassiness of the beer's Euro-hops. The classic ploughman's platter. The cheese: buttery, slightly fruity, and tangy. A taste contrast with the caramel malt and earthy English hops of the beer. A wonderful and effective demonstration of "1+1=3". The roast of the stout pulls the funk from the blue; the blue mold pulls the roast from the beer. The washed rind aromatics of the cheese mate well with the pungent aromatics of the beer. Both have soft, buttery character ... after the stink. A 19 year old asked for a beer in a northern Virginia restaurant on Friday night. He was asked for ID. When he couldn't produce it, he was refused service. He stabbed the waiter and the manager. In lieu of Franklin's many other contributions, we may forgive him this trespass. Now comes author Bob Skilnik to debunk the idea of Pilgrims and beer at Thanksgiving. and it now being the 19th of December. Ah well, there goes the Thanksgiving timing. Skilnik continues that it was the settlers, through their dilly-dallying, who ran out of beer. The ship's crew didn't, and sailed back the following spring, avoiding a perilous winter sail. So what we have here, my friends, is NOT a party of starving Pilgrims who simply pulled up to Plymouth Rock because they were out of beer, had no water and no "victuals" on hand. No, what has been described instead was a group of naive individuals who called a little bit too much on God for direction, failed to heed the philosophy that "God helps those who help themselves," took too long to pick a spot to settle down, even if it was to only to be for the winter, and as a result of indecision, watched as more than half of them died through the winter. Contrast that with current Georgia governor Sonny Perdue. Earlier this week Perdue timed his public prayer session - calling upon God to bring rain to his drought-ridden state - with stated meteorological predictions of rain for a few days later. And it did, rain. "God helps those who..."
The entire piece is available on Skilnik's blog: Beer (and more) in Food. By the way, Skilnik has also - as did Mitchell and Sides above - corrected the record on Franklin and beer. And he is the author of the book, Beer & Food: An American History. I once heard Jason Oliver of D.C.' s Gordon-Biersch note that casked beer - lager or ale - is simply beer that is put in a cask. It's how a brewer prepares the beer, Jason emphasized, that makes it a keller bier, or its ale cousin, real ale. Last night, I enjoyed a pint of Clipper City's Winter Storm Imperial ESB pulled from a cask at Birreria Paradiso, the subterranean beer cubby of Pizza Paradiso in Georgetown, Washington, D.C.
At a blind tasting conducted by the Baltimore Sun, Winter Storm was chosen as one of the favorites - national, local, or international - of the season. On Wednesday, 5 December, Jason and I will be guest hosts at Taste DC's second ever Beer Basics 101 class. Along with 6 other beers, I'll be bringing a cask of Winter Storm, and Jason, his winter doppelbock. Wednesday it was 19°C around these parts. Down in Charlotte, North Carolina - where I drove round-trip to my distributor's offices - it was a sunny, balmy, un-November-like 22°C. This morning it's a brisk 5°C, with the leaves whipping about in 20 mile per hour winds (hmm, that would be 23 kilometers per hour). 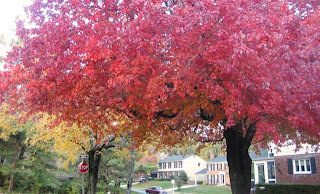 The leaves are finally falling en masse. The temperature dips to -1°C tonight. It's feeling as if it were indeed November. And that's real ale weather! ... there is more to Cask Conditioned Real Ale than a beer pushed through a beer engine. Dispense from a beer engine is currently a very popular way of serving not only cask conditioned real ale, but also any other beer. There’s no trick to pulling any beer from a beer engine–it’s just a pump. Cask Conditioned Real Ale is beer that emphasizes freshness above all else (with the exception of Old Ales). The live yeast in the cask adds to the sensation that this is truly fresh, live beer. The conditioning and serving process insures a level of freshness. <...> It is not uncommon in the UK to have an Ordinary Bitter go, literally, from grain to glass in less than 3 weeks. This is fresh beer. B.U.R.P. 's homebrew festival, except for a few exceptions, limits the beers to running beers, that is beers of session strength, and to more traditional English and Scottish styles. A lower alcohol beer that is conditioned and served fresh from a cask shines in a way it could not in bottle or even on draft. How else could a low alcohol mild win the commercial beer Great British Beer Festival this year, over its higher alcohol brethren? A festival celebrating commercially brewed cask ales was held in early October in Baltimore, sponsored by the Society for the Preservation of Beer From the Wood. I've previously referred to her sharply witty remarks on wine and beer. I'll do it again. This year I'm giving thanks that I don't have to write one of those compulsory "What wine goes with Thanksgiving?" columns. I get so sick of reading the same regurgitated tips. To me, a gluttonous meal in honor of the Pilgrims deserves an appropriate beverage, one to sip or guzzle as personal tendencies allow. When I think of the epic turkey-day meal, my brain conjures large tankards of rich ale, the kind I imagine the Mayflower passengers might have enjoyed. I pick Saison; she favors ESB. When pairing beer and food, you'd have to work hard to 'do' it wrong. The first rule is that there are no rules, only enthusiastic suggestions. 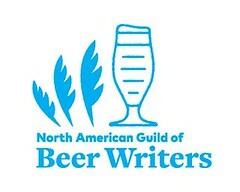 Here's more from the Brewers Association. Upper-body fat has negative effects and lower-body fat has positive effects on the supply of long-chain polyunsaturated fatty acids that are essential for neurodevelopment. Thus, waist-hip ratio (WHR), a useful proxy for the ratio of upper-body fat to lower-body fat, should predict cognitive ability in women and their offspring. Due to greater store of omega3 fatty acids, curvy women and their children have higher IQs than do skinny women and their children. Many of us men and women did not need a study to know this already. But has a similar beer research study been funded? A scientific journal - Proceedings of the National Academy of Sciences - has announced the discovery of the earliest evidence of fermented cacao in Central America. Researchers have found cacao residue in pottery remains dating from 1100 BC in Honduras, which is five hundred years earlier than previous digs. The scientists speculate that this fermented cacao beverage may have been an indicator of social prestige or wealth. This was a very different beverage from the chocolate beverage that the much later Spanish invaders found the Mesoamericans to be drinking. In fact, the involved process of creating chocolate as we know it may have been an accidental discovery. Young's has its Double Chocolate Stout. Now, dare we expect this ancient cacao-beer to be recreated at a certain Delaware brewery? Two friends went off to London a few weeks ago. When they asked, "Where should we go for good beer? ", I gave them a list of recommendations that another acquaintance had given to me. We had a great, but 'sticker shock', time! We got to some of the places your friends recommended. In particular we went to 'The Market Porter', The Jerusalem Tavern', and 'The Wenlock Arms'. 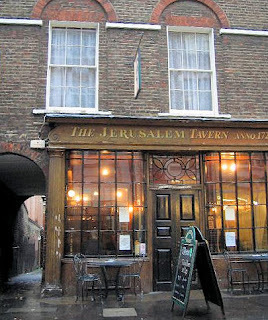 The 'Jerusalem Tavern' had six (6!!!) cask conditioned ales behind the bar. The list you gave to us attracted attention - we showed it to nice people we met in the pubs and they offered insight into the list. One guy in particular at the Wenlock Arms thought it fabulous and gave us info on the list. The pubs were the best value for money on the trip. UK blogger Stonch has since posted a mashup listing his 20+ choices for London's best pubs, bars, shops, and breweries. It's a Google Map on which you click a location to find out more. I don't know if Stonch placed them in order of preference, but the Jerusalem Tavern is the first on the list. Turns out it's his local. I wonder if my friends and he had pints together. When you walk in to the Wenlock, people will look at you. They might even stare. That's not because you aren't welcome - such a famous pub is used to outsiders, indeed it thrives because of them. You'll be given the once over because drinkers at the Wenlock aren't just interested in the beer. They're interested in the people that make the pub what it is. When you walk in, say hello, and order a pint, you become one of those people. As of this morning, one US dollar is worth 0.4827 UK pounds. That's sticker shock, indeed. A similar beer-mashup for the US is called the Beer Mapping Project. As with Stonch's blog, it uses Google Maps to exactly pinpoint US breweries, brewpubs, beer bars, and beer stores. Reviews are provided by on-line participants. Tuscarora Mill of Leesburg, Va. In early October, I was a co-host for a Beer, Cheese, and Chocolate Tasting at the Old Brogue Pub in Great Falls, Virginia. It was a fund raiser for the Washington D.C. chapter of the national mental health non-profit NARSAD. The evening had a bittersweet poignancy to it. Beer and whisky writer Michael Jackson, who died in late August, was suffering from Parkinson's, as had my father. Some of the money raised will fund research on Parkinson's Disease. The cheese and chocolate was provided by Arrowine; cheesemonger, Perry Soulos, provided the cheese descriptions in the program and talked on the cheeses. The beers were provided by Clipper City Brewing Company; I spoke about those and the pairings. The evening raised over $12,000. Make a donation here. The 1st pairing was Oxford Raspberry Wheat with Fromager d'Affinois. When ripe it has a runny texture that coats like icing. The rind is flawless and adds flavor to the sweetness of the cheese. This truly is an addictive cheese. Cows milk/France. The slight tartness of the Raspberry Wheat was a good foil for the buttery cheese. The 2nd pairing was Small Craft Warning Uber Pils with Abbaye de Belloc. The beer is a deep golden helles bock but with a firm structure of Czech and German hops. 7% alcohol by volume (abv). This gourmet cheese has the shape of a flat wheel with natural, crusty, brownish rind with patches of red, orange, and yellow. The rind is marked with tiny craters. the flavors of the abbaye de Belloc cheese are smooth, buttery, nutty, and sweet; a very interesting and addictive cheese. Sheep's milk/France. Often, I'll use sheep's milk Manchego to pair with Small Craft Warning. But the delicious Abbaye cheese combined a nutty character with a sweet middle: a wonderful mate for the Small Craft Warning and its shortbread-like malt base and Euro-hop floral character. The beer is a ruddy-hued winter warmer, brewed with English malts and a hop cépage of English and US varietals. 7.5% alcohol by volume (abv). This cheese has a full, deep-layered flavor, a firm yet buttery texture, and a sweet grassy aroma. The flavors hint of nuts, apples, and hay. Keens Cheddar is made in the traditional way, using un-pasteurized milk from its own herd of cows. It has a moist texture with a tangy bite and a full-bodied flavor. Cow's milk/England. 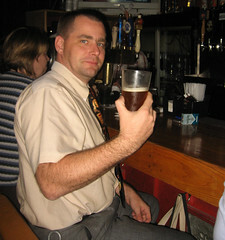 The combination of a pint of bitter (Extra Special Bitter, i.e., ESB, while actually being one particular commercial English beer, has come to mean a stronger pale ale - or bitter - in the US), a hunk of fresh bread, and a piece of cheddar is often referred to as a traditional Ploughman's Platter - even though that moniker may be of more commercial derivation. Be that as it may, the two together made for a wonderful combination. The cheese's tang seems to contrast well with the earthy and lightly caramel flavors of the ESB. The beer was served fresh from a cask. Many in attendance were wine people; several came up to me afterward saying that they had no idea about what was meant by beer's freshness ... until tasting from this cask. The 4th pairing was Peg Leg Imperial Stout with Colston Basset Stilton. Whereas many strong stouts tend to be extremely roasty and bitter, this evinces more a baker's chocolate character, and is, of course, very dark in color. 8% alcohol by volume (abv). Colston Bassett, a rural village in the heart of the English countryside, has become famous to lovers of fine cheese worldwide. Greenish-blue veining is liberally spread through a crumbly, rich, ivory paste. England's only name protected cheese easily earns a spot in any cheese counter. Cow's milk/England. It's a flavor dance. The roasty bitterness of the stout softens the moldy aromatics of the blue cheese; the funk of the blue softens the roast of the stout. The 5th pairing was Loose Cannon Hop3 Ale with Tellegio. Hops, hops, and more hops. In fact 3 pounds of whole leaf US hops hops per barrel, added to the brewing and fermenting at three points. Very herbal and fruity. 7.3% alcohol by volume (abv). The rind in an intense burnished orange-brown color with several molds, and a stamp indicating it is a true Tellegio. It is a wonderfully distinctive cheese with a wide range of flavors including a meaty richness, accented with yeasty, fruity qualities, and a tangy, salty bite. It has a very pungent aroma. That sounds like a beer that is made specifically to be served with a beer! The pungent aromatics of the Loose Cannon complement and play with the like aromas of the Tellegio. The 6th and final pairing was Below Decks Barleywine-style Ale, not with cheese but with chocolate! It's an English-style strong ale that can, unlike most beer, be cellared. It will develop additional flavor as it ages, often maderizing. 10% alcohol by volume (abv). The nutty, tropical fruit, toffee, and sherry notes of the barleywine were a complementary mate for the chocolate. Read more on beer and chocolate pairing here. Several members of NARSAD's local board had met with Perry and me at Arrowine a couple of months earlier to plan the evening. We tasted the beer and cheeses and made our choices. Beer and cheese was one thing. Beer and chocolate: it pleasantly surprised many. here’s a thought from two infantry combat veterans of the Vietnam era’s “wounded generation”: if you truly believe that our Iraq and Afghanistan veterans are like those who fought in World War II, let us provide them with the same G.I. Bill that was given to the veterans of that war. In terms of providing true opportunity, the World War II G.I. Bill was one of the most important pieces of legislation in our history. College costs have skyrocketed, and a full G.I. Bill for those who have served in Iraq and Afghanistan would be expensive. But Congress has recently appropriated $19 billion next year for federal education grants purely on the basis of financial need. A G.I. Bill for those who have given so much to our country, often including repeated combat tours, should be viewed as an obligation. Read the entire op-ed and forward it to friends and family, members of Congress, and the President. Support the troops, if not the policies of the President. Jump here for a press release concerning a step of support for veterans that Clipper City Brewing Company has taken. Time can mist our memories. Just as Mom and I had sat down and recreated her recipe version of Nana's Christmas (and Easter) cookies, my sister called. Carol is our family's ausukai toji; she had Mom's actual recipe card. So here it is, with additional tips from Carol's experience. Beat eggs in large bowl. Add salt. Add sugar and vanilla, and beat. Take small portion of flour and sift with baking powder. Slowly add flour mixture, alternating with the milk and cream, to the egg/sugar. Turn the dough onto a well-floured board. When the dough is floured just enough to a good consistency, take a small portion and roll it out thin (the thinner the better). Cut the dough into small diamonds. Cut a small slit [1/2 inch, or the size of a thumb, because it stretches out.] in the middle of each and pull an end through the slit and back out the other end. Pronounce ausukai: oh SOOK (like "took") ay (in between "I" and "(h)ay"). There's a walnut tree at the corner of the property. It produces an annoying lot of walnuts every year: annoying when you have to clear the lawn of them, annoying when your head receives the painful plop of a walnut. 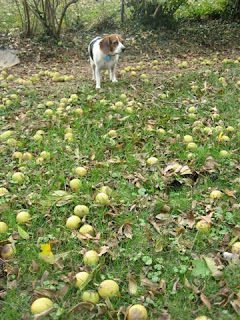 The two dogs love it though: the walnuts attract many winter-foraging squirrels. This autumn, there were more walnuts than usual. Many more. So, after a lengthy afternoon round-up, we rewarded ourselves with a special delight. 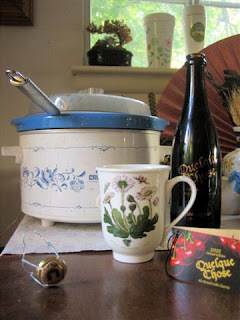 We mulled beer, spiced and heated in a crockpot. Quelque Chose is uncarbonated, so it lends itself to heating without bubble-over. For something else (which is a rough translation of the beer's French name), try Quelque Chose ice-cold in the summer, and as a Mimosa for brunch. It's an intriguing observation, but I'd take the following statistic with a grain of salt, or, should I say, corn of barley. Papazian ... was heartened that 40 to 50 percent of the folks attending this year's [Great American Beer] festival were women. “I think there are a lot of women who never thought they would be beer drinkers until they tasted what craft brewers have to offer,” he said. With a statistical spread of +/-20%, that must be his personal guess. Charlie Papazian is, however, president of the Brewers Association. As such, he would be in a position to notice such a positive gender trend. It's been a long time coming. Particularly intriguing was a conversation between two women who appeared to be just past the minimum age. They were standing in line, eagerly waiting to receive refills of Hop Devil Ale, an India Pale Ale, brewed in Pennsylvania by theVictory Brewing Company, that is big, bold, very bitter, and very aromatic. At present there're also more men than women who make our beers, a condition that began with the industrialization of cottage brewing a few hundred years ago. 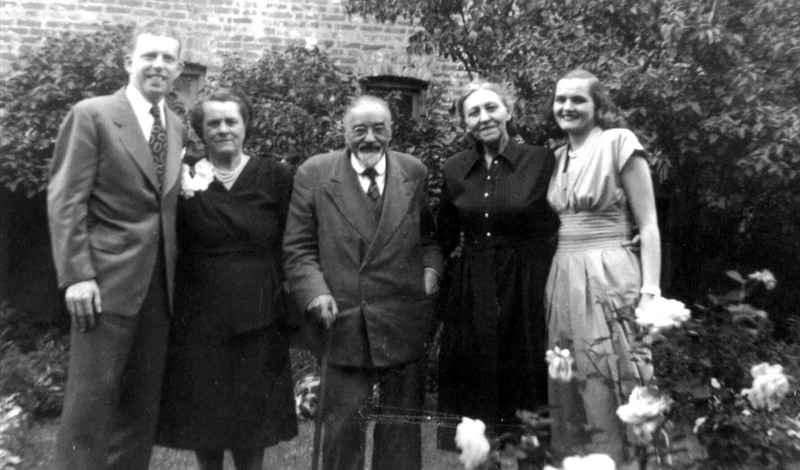 Josef Ambraziejus (Mom's father); Anna (Dad's mother); Gene Cizauskas (my mother). Amilija Ambraziejus was my Nana, my mother's mother. She emigrated to the United States in the early 20th century from Tsarist-occupied Lithuania. Her way —in only slightly better quarters than common steerage— was paid by her four brothers, already in the United States. Barely a teenager, she was expected to repay the debt by taking care of her brothers: doing the housework, cooking, cleaning, house-repair, etc. A strong-willed woman, she turned the tables, soon becoming the de facto head of the household in a few years. She married young, to a man over 20 years her senior, my grandfather, Josef Ambraziejus. My mother remembers Nana doing such things as the plumbing and tarring the roof ... in addition to the 'expected' household chores such as preparing the big meals for the extended family - which seemed to extend yet more on Sunday afternoons and holidays. During it all, Nana would remain stylish in clothing and demeanor, and firmly in control. And, she was, indeed, a wonderful cook. 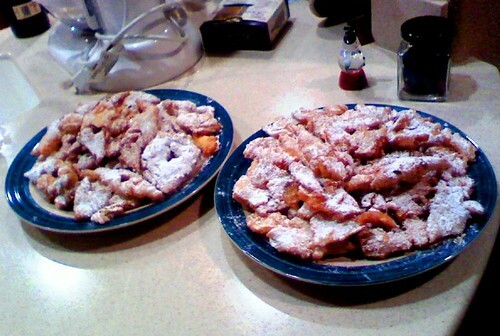 Here is my mother's version of Nana's recipe for Christmas/Easter sweet fried cookies, called "little ears", or ausukai (sometimes called kruscuki). In our Lith-English, we kids would call them oh-sookies. Mom, as Nana had done, would cook them for our traditional Lithuanian Christmas Eve Kucios meal; the preparing and frying were often as fun as the eating! Beat yolks and egg together until thick and the color of lemon. Sift the flour with a pinch of salt. Whisk the flour, sugar, and the cream into the egg mixture. Allow to stand for a few minutes. Flour the kneading surface and your hands. Knead the dough on the surface until no longer sticky. Roll out the dough until it's very thin. Then fold the dough into thirds back onto itself. Roll out again; fold again. Roll out again, very thin. Cut the dough into small diamond strips, about 4" x 2". Cut a lengthwise slit in the middle of each strip. Pull the other end through the slit. It's not an ausuki unless you tie this knot! In an oversize pot or a deep fryer, heat the vegetable oil to 350ºF. Fry for about 3-4 minutes, only a maximum of six at a time, so that the oil stays hot. When the ausukai appear golden, fry for about 20 seconds more. They should puff up. Do not brown! Drain on paper towels and sprinkle with the powdered sugar (the part we kids really enjoyed!). One wonders what founding father, populist, and rabble rouser Samuel Adams would have thought of a beer priced at $150 per 24 ounce bottle. A story in Wednesday's Washington Post presented details of the Boston Beer Company's latest iteration of its Utopias beverage: 27% alcohol by volume. More power to brewery president Jim Koch and his brewers for such an achievement. But is it beer? I don't mean to single out Koch, a pioneer in our craft and business. Indeed there appear to be quite a few brewers and beer lovers evincing an unseemly envy of wine and spirits. There's a puerile braggadocio: mine is bigger, hoppier, stronger than yours. Not to mention pricier: blogger Alan McLeod's take on that, including to a blizzard of readers' comments. So, maybe it's time for a latter day Samuel Adams to lead a new Boston Tea party. If I want whisk(e)y, I'll drink whisk(e)y. If I want wine, I'll drink wine. But those wine barrels and spirit casks, in our fermentation rooms? Dump them overboard! Let's get back to the democratic, non-elitist, incredible pleasures of good ol' beer. Koch's best line in the piece: "It's not rocket science, but it is 'grain surgery.' "
In other news, Boston Beer Company's stock lost 25% of its value yesterday. The venerable Olney Ale House is one of those places that you might have thought had hosted many a beer and wine dinner in its 30+ years of operation ... and you'd be wrong! 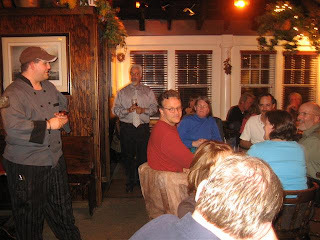 Because it was not until this past Monday that Olney hosted its first-ever beer dinner. Current owner John Roach and managers Amanda and Mike welcomed over 50 patrons. Chef John Leisinring offered commentary on each dish as it was served. Rich Fleischer, owner of Hook and Ladder Brewing spoke on his beer. And I did the emcee-ing, an invitation which I considered a signature honor. There was an hour-long reception beforehand with wines, cigars, and passed appetizers (and beers). served with Hook and Ladder Brewing's Backdraft Brown Ale. the nation's best Vienna-style Lager (Great American Beer Festival). served with De Koninck Ale. Silver Medal winner, 2007 Great American Beer Festival. served with Clipper City's Winter Storm Category 5 Ale. served with beer cocktail of Lindemans Framboise and Rogue Mocha Porter. Beer and food, beer and cheese: those are topics that can surprise many who might be skeptical about such pairings. Well, then imagine the reaction to beer and chocolate together as food partners! Monday's mousse of berry and chocolate was served with a beer blend of tart Lindemans Framboise and Oregon brewery's Rogue's Mocha Porter. It was an appropriate, and appreciated, pairing at the dinner. 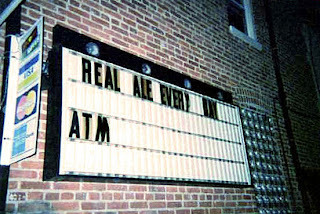 For many years, the Olney Ale House had been one of the only oases of good beer in the DC area. I first visited in the early 1980s, then enjoying my first-ever draft Liberty Ale. Back then, the Ale House sat at an exurban crossroads. Today, it's the same intersection toward which a bit more suburban sprall has encroached, but the Ale House still has that rustic hide-away feel. 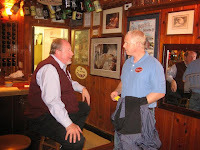 Pictured are owner John Roach (l), and Hook and Ladder's Rich Fleischer (r). More photos here.